You are looking for a zucchini recipe, are you? Are you getting weekly gifts of zucchini from your gardening friends? What should you do with it? Everybody is looking for a zucchini recipe at this time of the year. Zucchini are exploding right now, growing at light speed, overflowing the market stalls. I never tire of them though, crispy and delicate, they can be used to add crunch and lightness to almost everything. This is a fabulous recipe – and a very easy one – that can actually be adapted to all sort of greens like asparagus, artichokes, broccoli, whatever the season brings you. Before starting however, please read my basic lasagna recipe. I will briefly remind you that to make good lasagna you need fresh lasagna noodles which must be blanched in boiling water before layering them with a modest, and I repeat modest, amount of condiments. Love yourself and don’t listen to Kraft telling you to take shortcuts. Making a proper lasagna might seem intimidating and time consuming, but it’s actually a breeze if one has good ingredients and follows a logical order in the preparation. In addition, lasagna freezes really well, so you can make it in advance and give some to your gardening friends as a gift 🙂 . First of all empty your worktop so to have ample space to work. Sautee zucchini in 1 tablespoon olive oil until slices just start to become golden . Make sure to use a relatively large non-stick pan so the zucchini will cook quickly and don’t boil in their own water. Add a pinch of salt, one finely minced clove of garlic and a few torn basil leaves, stir quickly and as soon as it is fragrant transfer into the bowl of a food processor . Make 1 and 1/2 cup of fairly liquid Bechamel sauce, season with salt and a pinch of nutmeg. Pulse chop the cooked zucchini until finely diced, add 2/3 of the Bechamel and 100 gr (3.5 oz) grated Parmesan. Preheat the oven at 200 °C (400 F). Butter generously a 30 x 22 cm (12 x 8 inch) roasting tin. To blanch the pasta sheets, place a shallow pan, half full with water on the heat and bring to the boil. Using thongs, deep one lasagna noodle at the time in the boiling water until just soft, approx 30 sec, strain and place in one single layer in the buttered tin. Once the bottom of the tin is covered by lasagna sheets, pour 1/3 of the zucchini mixture over the pasta sheets and spread it in a 1/2 cm (1/4 inch) layer. Top with 1/3 of the sliced caciotta and 1/3 of the shredded ham. Repeat two more times using all of the zucchini mixture, ham and sliced cheese. Top with one last layer of pasta sheets, cover thinly with the rest of the Bechamel, sprinkle with two tablespoon of Parmesan and bake for 25 min or until bubbly and golden around the sides. For a vegetarian version substitute ham with smoked cheese or gorgonzola. “120 gr (1/4 lb), finely sliced then shredded” I assume it is the ham? yes, it is, I have changed the list, thanks for noticing it! This looks delicious! I’ll try it. 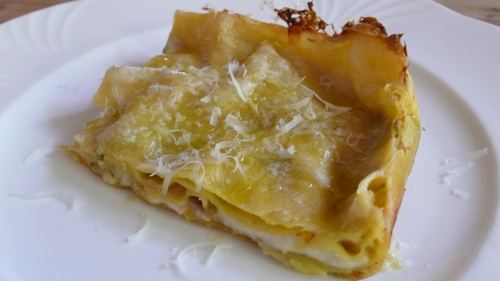 I love white lasanga and although this recipe reminds me that you can enjoy it even during the summer months… great use for the seasonal profusion of zucchini! thanks Meg! In beautiful Liguria you could even substitute the ham with some seafood, e.g. quickly seared scallops, yum. Made this wonderful lasagna over the weekend. I especially love the roasted zucchini filling. Lighter than traditional lasagna, and perfect with a glass of pinot grigio. thank you Susan, next spring try it with grilled asparagus! This looks amazing – I wonder if I can find caciotta around here? Jerry you could use fresh mozzarella or a mild cows milk cheese, e.g. young Asiago. In desperation, American mozzarella, the solid one, but only if you have no alternatives :)! I make something similiar, but I take the grated zucchini and stir it into some fresh pesto, then layer the zucchini/pesto with bechamel, pine nuts and parmigiano. amd of course fresh pasta – Delish! oh yes, that’s fabulous version! grazie Ale, sono contenta che ti è piaciuta la versione vegetariana!